How to Choose a SMS gateway service provider in India? Smart 5 SMS is one of the India’s leading Bulk SMS Service Provider Company. We serve our customers with the best solutions to send group messages pan India via multiple SMS Gateway Networks. With the help of our Premium Bulk SMS Services, you can send critical messages such as commodity prices, share prices tips etc. API integration is also available to send bulk SMS from your own application. Our SMS service work throughout India through multiple gateway networks. We strictly follow the guidelines set by TRAI (Telecom Regulatory Authority of India) like sender Id, (Interconnect Usage Charge) IUC charges. We provide both transactional and promotional routes for sending Bulk SMS Online for brand awareness, product launch, promotional offer, etc and informational SMS like critical alerts to the categories approved by the TRAI such as insurance alert SMS, banking transactional messages, short informal notice, etc. With the help of these templates based transactional messages, it allows to send message with the help of sender’s id and 24x7 SMS Services. We provide a promotional and transactional Bulk SMS Marketing services in India. Marketing services use mobiles to alert reminders, service messages, send tips and other forms of communication to customers over a wide geographic area. Bulk SMS will help you in improving your customer relationship and prospects. No matter how good your marketing campaign is, it is of no use if you can’t get the information out to at least majority of your customers. SMS providers determine the success of your marketing campaigns and thus, it is important to carefully select the one that is ideal for your business. <H1> How to choose a SMS gateway that accelerates your ROI as a start-up? One of the most important aspects for choosing a affordable Bulk SMS provider for start-ups is the cost effectiveness. With the numerous costs that start-ups incur, they need a service provider that provides them highest return on investments. Getting information about operational costs, bulk prices and price per SMS will help compare different providers and get to the one that is most economical. Along with that a complete delivery report can helps them a step ahead to their decision making process. Check some interesting price chat at Smart 5 SMS. Choosing a provider that ensures fast and guaranteed delivery is important. You can use statistics from previous years to assess a providers bounce rates and average time of delivery to get an idea what to expect from their future services. Smart 5 SMS bulk SMS service provider ensure you a 100% delivery report with API support. The Application Programming Interfaces (APIs) are set of tools that allow two different systems to interact with one another. When looking for a bulk SMS service provider, you must seek one that has a full set of functional and well-documented APIs. Which Smart 5 solution make it easy and simple with the user friendly dashboard. When you start using a SMS provider for a business that is a startup and has relatively newer operations and customers, you are likely to have a lot of cliches. These need to be fixed immediately so that Smart 5 SMS provides 24x7 customer support and do not hamper your business customer. Selecting a provider that focuses on customer care and offers instant support and advice on your SMS campaigns Smart 5 SMS can be your best Bulk SMS service provider. how can bulk sms service help you to promote your political campaign!! The election season coming up, it is currently time for the political gatherings to contact the voters. Winning a relation requires effective strategizing and interfacing with the voters. You have to influence them to comprehend the great things you have improved the situation them and the things that you will have the capacity to do if your party comes in administration. Presently, it is unrealistic for any party to contact each voter in each voting constituency to disclose to them your election purposeful publicity. Anyway, what would you be able to do? How might you contact the voters? Indeed, the appropriate response is straightforward. You have to use the Bulk SMS service. To achieve your focused on voters in a split second, you should look for the assistance of the Bulk SMS benefits and guarantee them about your essence. At �The SMS World�, we ensure that you get the best quality SMS administrations. Be it voice SMS or What�s App SMS, regardless of how you intend to unfold your race purposeful publicity to the voters, you will have the capacity to do it proficiently with our assistance. Reaching out to people is one of the key areas of any campaign. Even when it comes to a political campaign it is important that you use means which help you connect with the common man. Social media and internet are powerful tools but for a political campaign you must also include a system which helps you reach out to millions of people within a few seconds. Yes right! The system is Bulk SMS Service which helps you to connect with large no. of audience through sending message in bulk in seconds. You need to have the best strategy to promote your campaign if you want to win the elections in the largest democracy that is India. If you want to win maximum votes then you need to have an effective mode of communicating with the common man. You need to reach out to the different sections of the society. Bulk sms is one of the easiest ways of communicating with your target audience at the click of a button. You do not have to go anywhere. In just one click you can promote your party to young and the old. Almost everyone today has a mobile phone. So, it becomes easier to promote your party to more number of people. You can send alerts to the citizens at regular intervals. In these alerts you can tell the voters about your party agenda. You can tell them in brief about your plans for the common man once you win the election. You can inform the people about the date, time, venue of the election rallies and meetings. You can send them reminders about the voting day. You can ask them about how they can verify if their name is there in the election list or the procedure to get their names added in the election list. You can even send them a request to cast their vote to your party. Bulk SMS Marketing also gives you the option to send regional messages. This is one of the best ways of conversing with more number of voters. If you want to ensure that you leave no stone unturned in promoting you political party in every nook and corner of India then opt for bulk sms services as we leading Bulk SMS Service Provider Company in Odisa, Noida, Gurgaon, Delhi, and Mumbai that offers both Promotional and Transactional Bulk SMS Service to all over the India to provide best quality results. If you want the best bulk sms campaign for your political party then opt for professional service provider. Smart 5 SMS provides you the one stop solution for Bulk SMS with 100% delivery report with API support. To reach every single individual for promoting your business or any other campaign bulk SMS or Voice call system is the best way. In political field Bulk SMS or Voice call in playing an important role to convey the message or party agenda to its voters. Through SMS or electronic media, the party leader can send vote appeal directly to people's mobile phone. 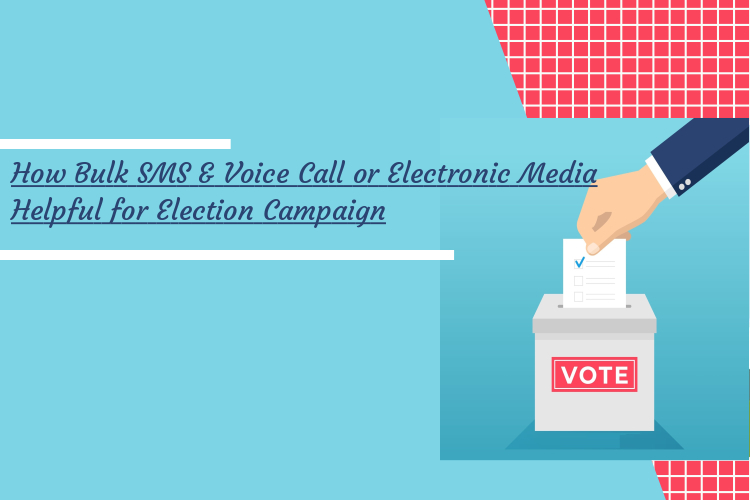 Bulk SMS marketing for election campaign has to turn out to be one of the most effective tools for Election Campaigns. It is the highly effective communication tool to arrange party meeting or convey the message to party member related to an election campaign, through bulk sms marketing in India. i) It is a unique process to reach your voters and attract more public to support your party. ii) It is very reasonable and cost-effective bulk sms campaign which gives you the high return on investment. iii) Everyone read their SMS first, that's why Bulk SMS campaign for election is the really effective tool. iv) Younger people will attract more to your party because it is a modern marketing strategy. v) You can send information like party meeting, party agenda, election rally etc. vi) You can send the voice message to the public through voice call facilities. i) Response rates of SMS and voice calls are higher than other marketing channels. ii) Get regular updates regarding party activities via SMS or Voice Calls? iii) Send personalized SMS in regional languages to voters/public. iv) Compare to door to door campaign it reaches faster and saves your lot of time. v) Easy to use with user-friendly SMS or voice call portal . vi) We provide 24*7 Support. 98% of people read election campaign messages, so Bulk SMS & Voice Call Campaign for Election is the effective process for a successful election campaign in odisha. For more details call Smart 5 SMS : 9776353638 or Email us: smssmart5@gmail.com. Digital Marketing is considered an effective marketing process than other marketing channels. If you are going to run your online business then Digital Marketing process helps you to gain more traffic as well as increase your sales accordingly. Local-based business has to focus on online marketing, as that’s where their target audiences are. 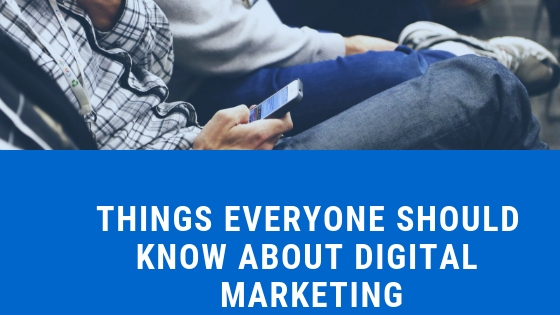 Here are five things everyone should know about digital marketing. As per the analysis, more than 50% of internet users are using mobile phone devices. You need to make your website mobile-friendly or mobile responsive to run your online business website smoothly. To reach your potential audience mobile apps are becoming the ultimate way. Companies are focusing on a mobile application which gives them more profit. Many customers are ignored mobile browser, that’s why the mobile application increases its demand among people. To run a successful Digital Marketing process for your online business you must need to be a tech-savvy person. You need to learn the basics of Content Management System (CMS) like Word Press which helps you to manage your website according to your SEO requirements. Everyone is using digital marketing strategy to establish a brand presence today because digital marketing are easy to connect with people rapidly. If you don’t adapt to the changing times of digital marketing tactics, you stand to lose potential clients customers. Through Digital Marketing Campaign , your brand identity will be increase through social networks and other promotion channels. Go with a proper brand strategy which helps you driven more traffic and as well as your brand awareness increase.